1997: Dracco founded in Denmark by brothers Jacob and Henrik Andersen. 2000: Dracco headquarters move to Hong Kong. 2006: Tine Norbøll begins developing Filly for Dracco. Dracco makes a deal with German toy manufacturer Simba at some point during the year. April 2006: In a now-deleted post that sadly isn't preserved on archive.org, a Danish freelancer describes making a Filly website for Dracco. This is the earliest evidence for the existence of Filly that I have ever found. 6 November 2006: Earliest version of Dracco's first Filly website that is preserved on archive.org. Sadly, there isn't much there as the website fails to load. 2007: Release of Filly Forest. 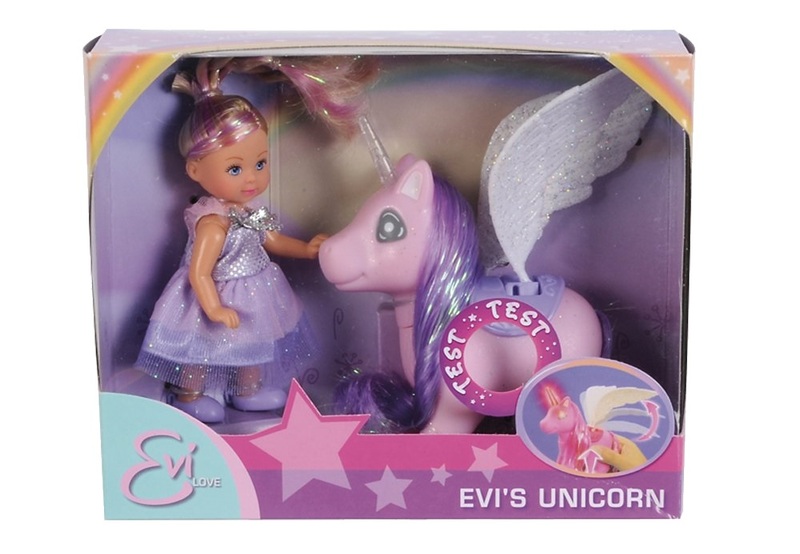 At the time, it was often simply referred to as "Filly" since it was the only Filly toyline yet released. Rather than the more fantasy-like setting of later Filly toylines, the Filly Forest Fillys were based on various real-life horse breeds. Filly Forest is now considered entirely non-canon. 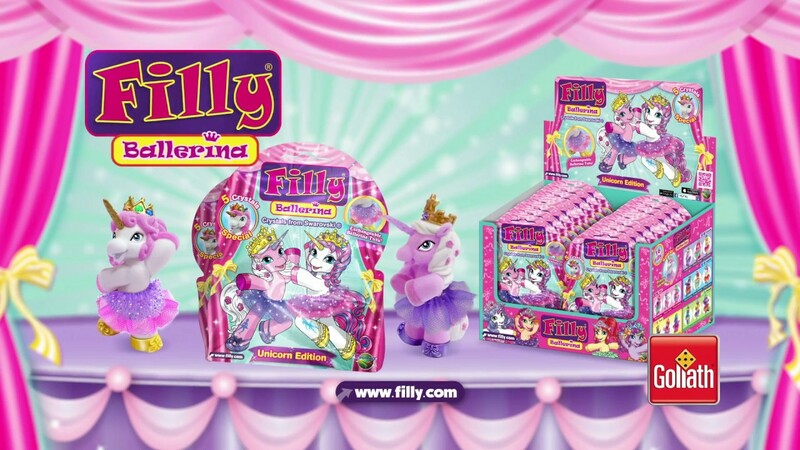 For more detailed descriptions of the Filly toy lines, please read our "Filling You In" article series. 23 May 2007: The earliest recorded version of Simba's Filly website on archive.org. Of note on this website is a fictional story about the taming of the first horse in Mongolia, which also appears in the first Filly Sammelband. Final iteration of the website with Filly Witchy. 30 May 2007: Hasbro sues Simba for copyright infringement. Allegedly, Simba infringed on Hasbro's G3 My Little Pony designs for their toylines "Little Fairy Pony", "My Sweet Pony", "Steffi Love Evi Unicorn" and "Steffi Love Evis Fantasy Pony". Notably, Filly is not mentioned in this lawsuit. On 20 July 2007, Hasbro wins the lawsuit and Simba is ordered to pay a fine. 2008: Release of Filly Beach Party!!. Two unicorns and a pegasus marks the first shift from realistic horses and towards fantasy. This toyline is now also considered entirely non-canon. 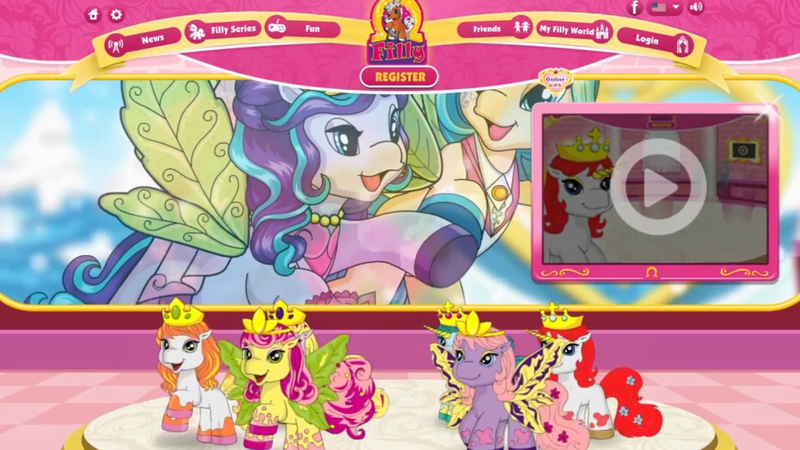 December 2008: Release of Filly Princess. This toyline was the first one to reach widespread popularity and the Filly brand itself would often be referred to as "Filly Princess" for years to come. The Fillys now have crowns, and there are elements of magic, but the story itself still takes place on Earth rather than in the Filly World which seems to not yet have been conceptualized. This toyline features the initial iteration of Cedric and was considered canon up to the release of Filly Royale, which essentially acts as a replacement for this toyline. 2009: First issue of Filly Magazine released. 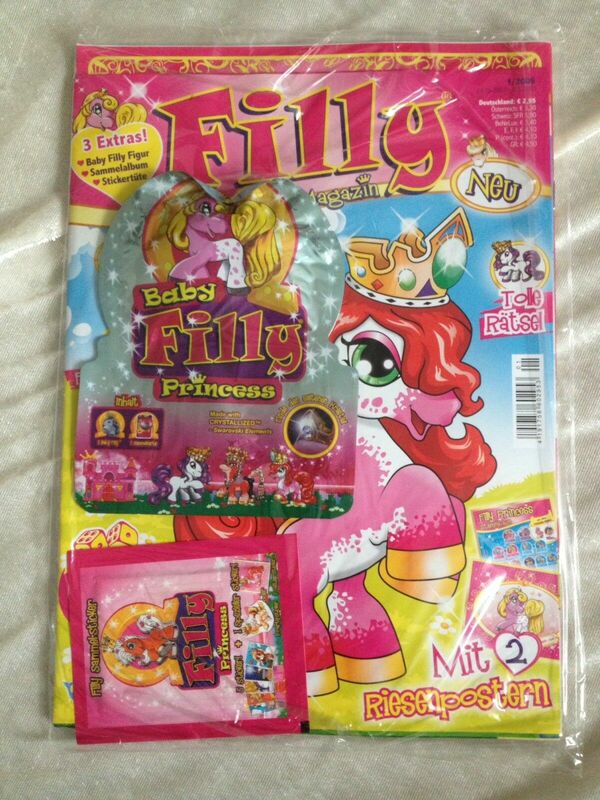 The Filly Magazine is as of writing still published monthly, although in less countries than before, and typically features a few short comics with characters from the most current Filly toylines as well as coloring pages, simple puzzles and other things of that nature. December 2009: Release of Filly Fairy. The Filly Fairys represent the first time where a type of Filly has notable distinguishable attributes (their sparkly green wings). This toyline is where Will is from, and represents the last of the "old" toylines before the Filly World was fully conceptualized although it represents a step towards it since magic has again become even more prominent in the character bios since the last toyline. It's the only one which seems to still be canon at the time of writing. 2010: First Filly Sammelband released. The Filly Sammelbands (Sammelbände?) are a collection of biographies for Fillys that are far more detailed than the biographies on the character cards and have constituted an useful resource for FillyWiki writers and everyone else trying to make sense of Filly lore. The first edition is a hardcover book covering Filly Forest, Filly Beach Party! !, Filly Princess and Filly Fairy. 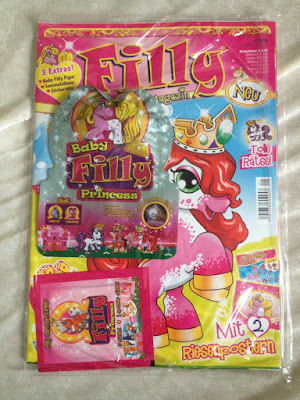 Further editions of Filly Sammelband would be released anually in magazine format from 2012-2017 and would feature every major Filly toyline up until Royale as well as a few unique characters that do not seem to have appeared in toy format yet. 30 March 2010: Hasbro sues Simba another time, again for infringing on the design of G3 My Little Pony. This time, it's because of the toylines "Little Fairy & Pony", "Unicorn Friends" and "Dream House". Again, Filly is not mentioned in this lawsuit either. This lawsuit takes considerably longer than the last one, and does not get resolved until 2013. October 2010: First episode of "My Little Pony: Friendship is Magic" airs. February 2011: Release of Filly Unicorn. This toyline finally established all the classic elements of Filly and can be considered the start of the modern Filly canon. The story takes place in the Filly World, the characters are divided into five groups representing five different elements (with color-coded crown crystals to match) with a special Filly (Princess Sparkle, the principal of Filly Funtasia) ruling over the land. This is also the toyline where Rose is from. Summer 2012: Development of Filly Funtasia begins. Tine writes the initial pitch bible, and BRB Internacional with its animation studio Screen21 does most of the animation work with some work outsourced to Black Dragon. June 2012: Release of Filly Mermaids. The first standalone toyline which can be considered a "spinoff" line as it does not follow the usual pattern established in Filly Unicorn. It was unclear if we would see these underwater Fillys in Filly Funtasia up until their sudden appearance in "The Lost Mermaid". The release history of Filly Mermaids is a bit unusual - while most Filly toylines from Fairy and onwards feature an initial release of 20 characters (plus one or more "special") ones followed fairly quickly by an addon pack of a few extra characters and possibly also an "Ice" and a "Silver" version (the full details of these additional releases is detailed on the German Wikipedia), the Mermaids kept receiving more and more editions, with the final one not coming until 2016. Late 2012: Intense phase of development. Many of the pieces of development concept art which have been posted on Funtasia Daily over the years were most likely created during this time period. January 2013: Filly.com is relaunched into its most recognized form - the flash site that allowed you to create and accessorize your own Filly. Codes for this website were included in toy packages for a number of years. 22 January 2013: Hasbro finally wins against Simba in the second copyright infringement lawsuit. Simba is yet again ordered to pay a substantial fine. 8 April 2013: MIPTV 2013. The yearly MIPTV and MIPCOM events in Cannes were associated with new Filly Funtasia information for several years as BRB and Dracco sought to advertise their show in this venue. Dracco apparently showed a Filly Funtasia trailer at this particular event, but there is no information preserved about what exactly they showed. However, I would say that it was most likely the video that has traditionally been called "Promo 2" on Funtasia Daily. It was called that because it was discovered on WorldScreen in November 2013, after the first promo was already known, but "Promo 2" was most likely produced earlier than "Promo 1" based on various details like the early version of the academy design. 15 October 2013: MIPCOM 2013. "Promo 1" uploaded to YouTube. A long clip from "The Cupcake Mystery", the first episode in the Italian broadcast order. This immediately led to various threads about it on brony communities, and a EqD post the next day. This essentially marks the start of the Filly Funtasia fandom. 24 October 2013: Creation of Funtasia Daily. 1 January 2014: Dracco signs a deal with Universal Trends for the sale and distribution of Filly toys. When the collaboration with Simba ends very shortly after this, they become the sole source of Filly toys. Early January 2014: Simba breaks their licensing agreement with Dracco, pulling out the rug from under the carefully laid plans for Filly Funtasia. This can be considered "the start of the problems", so to say. 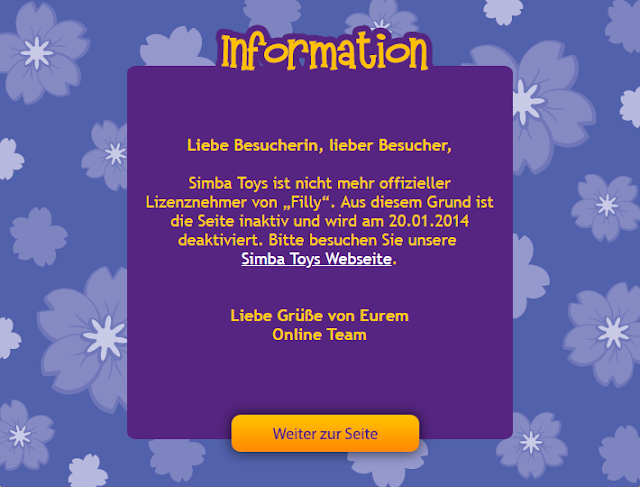 10 January 2014: A notice appears on Simba's Filly website that Simba is no longer a licensee of Filly and that the website will be closed down on the 20th of January. January 2014: The Filly Funtasia general thread on /mlp/ dies off. Remaining fandom activity moves to Ponychan, free from the page 10 reaper. February 2014: Release of Filly Butterfly. The first toyline not to feature any Simba logo on its packaging and the only "main series" toyline which most likely will appear in Filly Funtasia but has not yet done so, as discussed in our recent spoiler post. 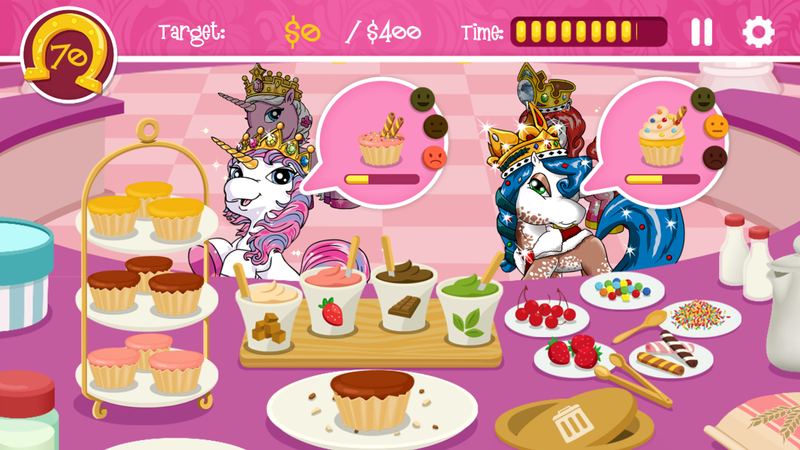 15 February 2014: Release date of Filly Funtasia delayed from "early 2014" to "Q4 2014". 28 February 2014: Dracco Netherlands initiates legal action against Simba in Hong Kong. Dracco alleges that instead of destroying their remaining stock of Filly toys, Simba sold it off without paying license fees and files suit against Simba to recoup them. The first lawsuit seemingly ends in failure on 28 March 2014, but is appealed. Early 2014: Creation of the first two Filly mobile apps, "Filly Cupcake Shop" and "Filly Photo Fun". They would be followed by Filly Witchy Adventure later during the year and eventually a bunch of weird slide puzzle apps in late 2016 that were probably created to demonstrate continued usage of various trademarks. 11 April 2014: MIPTV 2014. "Promo 3" is uploaded, a long clip show of footage from various episodes set to "From Now Until Forever", later used as the Filly Funtasia closing music. 30 March 2014: Release date of Filly Funtasia delayed again, this time to "2015". 1 October 2014: The deal between Universal Trends and Dracco comes to an end, but seemingly in a far more amicable way than the breaks with Simba and BRB. Toy distribution is now handled by Dracco Deutschland GmbH. 13 October 2014: MIPCOM 2014. BRB sends a video directly to Funtasia Daily and allows us to debut it online, which was very cool. This is the "Promo 4" video which consists of a long clip taken from one of the later parts of "The Blue Rainbow", the second episode in the Italian broadcast order. Late 2014: Release of Filly Wedding. 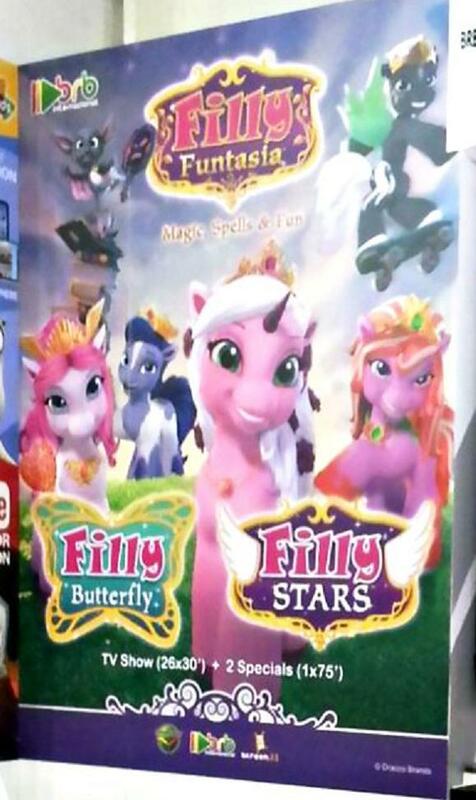 Another spinoff toyline which featured weddings of characters from Filly Princess, Fairy, Unicorn, Elves, and Butterfly. Notably, none of them married a Filly of another type. Can probably be regarded as non-canon. 19 January 2015: Filly Funtasia is delayed yet again. The new release date is "2016". 29 January 2015: Creation of Fillychan. 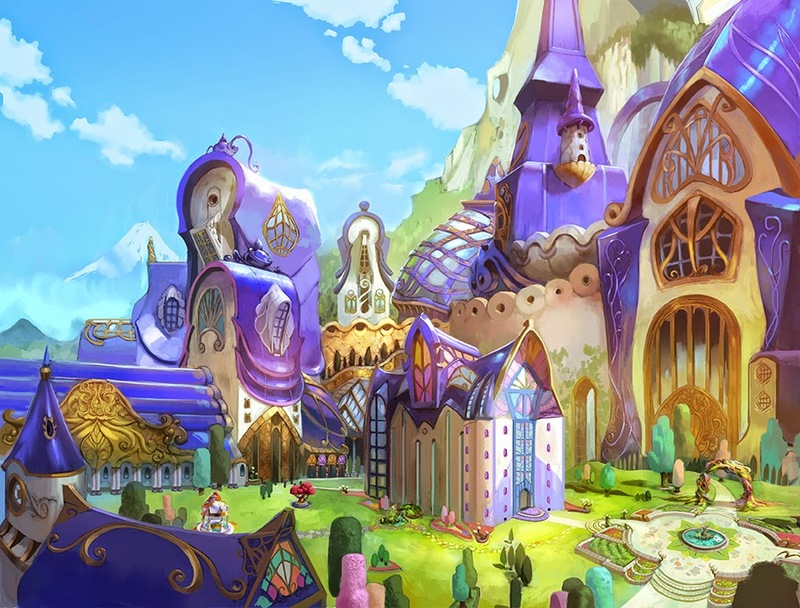 Main place for Filly Funtasia discussion after the death of the Ponychan threads but before the creation of the Funtasia Daily discord server. February 2015: Release of Filly Stars. This was the final toyline designed and written by Tine. This toyline features Filly Funtasia character Zack (which means that the toyline was planned well in advance as Zack appears in Filly Funtasia concept art that was probably made in 2012) and in many ways seems like the culmination of the world building as the subsequent toylines do not add that much to the overall lore of the series. The first Filly Magazine comic featuring the Stars starts off with the Butterflys meeting the Stars and the toyline itself has an ongoing story arch focusing on the relationship between the relationship between a Filly from the dark Moonlight side of Skylia (Zack) and one from the light Starlight side (Zodia). 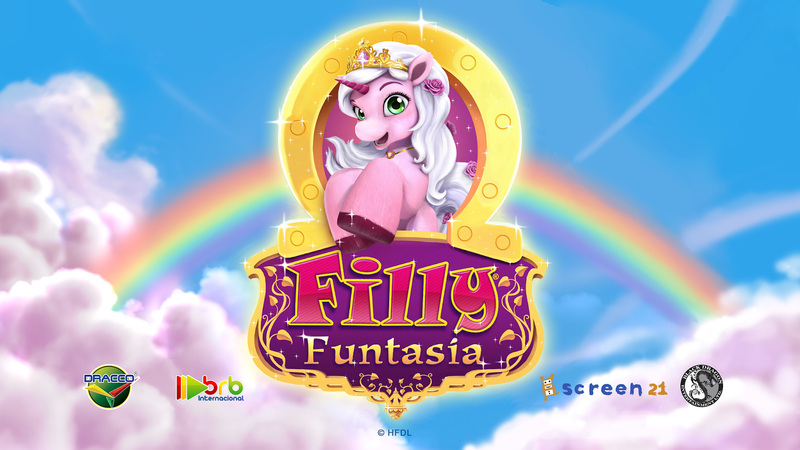 10 March 2015: Filly Funtasia is announced to air on Discovery Italy's K2. The show would eventually go on to air on Frisbee, which is another Discovery Italy channel. 13 April 2015: MIPTV 2015. The only news is the slightly updated Filly Funtasia website. June 2015: A somewhat more functional version of the website appears on dracconews.com. It is never updated or developed further beyond this point. 22 June 2015: Funtasia Daily hosts an AMA with Tine. At this point, she had already quit working at Dracco earlier during the year. 15 July 2015: Black Dragon uploads a trailer to Chinese video sharing site QQ of various shows they are working on, which features some previously unseen Filly Funtasia video material. October 2015: Simba and Hasbro announces a partnership where Simba becomes a new toy manufacturer for Transformers. 6 October 2015: MIPCOM 2015. After first releasing smaller segments of it in two different videos, "Promo 5" is finally released in all its glory. This promo is a clip show of various episodes set to "Magical World", later used as the opening theme of the show, showing significant graphical improvements to various scenes seen in earlier promos. Late 2015: Reportedly, BRB/Screen21 stop actively working on Filly Funtasia at some point late in the year. 10 December 2015: A short Christmas video is released. This would be the last Filly Funtasia video material for over two years. February 2016: Release of Filly Royale. This toyline is essentially an updated version of the Filly Princess toyline from 2008, with the setting and characters being updated to better fit the post-Unicorn Filly World as well as changes made in Filly Funtasia. Cedric now has an updated bio reflecting his penchant for inventions as seen in Funtasia, and the characters are now divided into color-coded families like the other newer toylines. This is the last toyline to get a toy site. Every main series toy line up until this one had a toy site under the now-offline dracco.myfilly.com domain that allowed you to read the bios and a short story about the toyline. 4 April 2016: MIPTV 2016. This time around, we get the news of two Filly Funtasia specials, "Filly Stars" and "Filly Butterfly". These would be made by BRB's 3D movie division, Apolo Films. News about these specials have been nonexistent ever since this event, and their existence is now very much in doubt. 5 October 2016: The second part of the legal saga between Simba and Dracco concludes. I will not try to understand the entirety of the legalese, but it seems like Dracco was successful. This is appealed again. 15 October 2016: MIPCOM 2016. For the first time in a few years, there is absolute silence from Cannes. What's worse, during October and November, BRB starts methodically erasing every mention of Filly Funtasia from all their various social media accounts while refusing to answer any questions about why they are doing it. The relationship between BRB and Dracco had apparently broken down completely at some point during the summer of 2016, but the details of why and when are still fairly hazy as of writing. February 2017: filly.com shuts down and starts redirecting to the Filly Stars toy site. 9 March 2017: Funtasia Daily discord server started. 22 May 2017: Screen21, BRB Internacional's animation studio, declares bankruptcy. This has no direct effect on Filly Funtasia as they had already detached themselves from it at that point. 25 May 2017: The third chapter of the Simba vs Dracco legal saga concludes and Dracco again seems successful. This is apparently appealed yet again. 4 July 2017: Dracco once again secures a lasting deal with an external toy manufacturer by signing a deal with Goliath Toys. They begin producing Filly Royale toys and have continued producing toys for all subsequent toylines. August 2017: Release of Filly Ballerinas. The pattern of February releases of toylines that held from Unicorn all the way to Royale is broken, and we instead get this somewhat strange toyline for an August release. It's essentially like one of the spinoff toylines in that it disregards the typical pattern with color-coded families and whatnot, but unlike the other spinoffs seen so far, this one recycles characters from previous toylines, including Rose. Can probably safely be regarded as non-canon. 10 October 2017: Dracco attends Brand Licensing Europe 2017, with Filly listed in the "Animation" category. This is the first sign that Filly Funtasia isn't abandoned ever since BRB's deletions in late 2016. 5 January 2018: Filly Witchy Adventure disappears from Google Play. Dracco would delete their other apps over the year and finally close their account completely. 16 January 2018: Finally, we have a release date again. In an interview on the Danish finance newspaper Finans, the Dracco brothers talk about their company's problems and reveal that Filly Funtasia would air in 2019. 7 February 2018: The fourth (!) part of the legal saga between Simba and Dracco finishes. This time, Simba appears to be the successful party. This seems to have been appealed yet another time, since according to an article from May 2018, the legal case was still ongoing at that time. This means that the final outcome of the legal battle which began in February 2014 is still to be determined as of writing. 23 March 2018: B-Water Studios uploads a Filly Funtasia teaser to their Vimeo account. The first Filly Funtasia video material in several years. It's unclear when exactly B-Water resumed the animation work on Filly Funtasia, but it is likely that they had not been working on it for too long at this point based on circumstantial evidence. June 2018: Release of Filly Angels. This toyline represents the first toyline since Stars three years earlier which acts as a classic mainline Filly toyline - not a spinoff and no recycled characters from previous toylines. Angels with feathery, pegasus-like wings have appeared in Filly a few times previously, including the special character Rafael who first appeared in 2012, which led to some speculation that Zack might be part of a future toyline dedicated to Angels before we found out that he was actually a Star, but in 2018 we finally got an entire toyline about them. 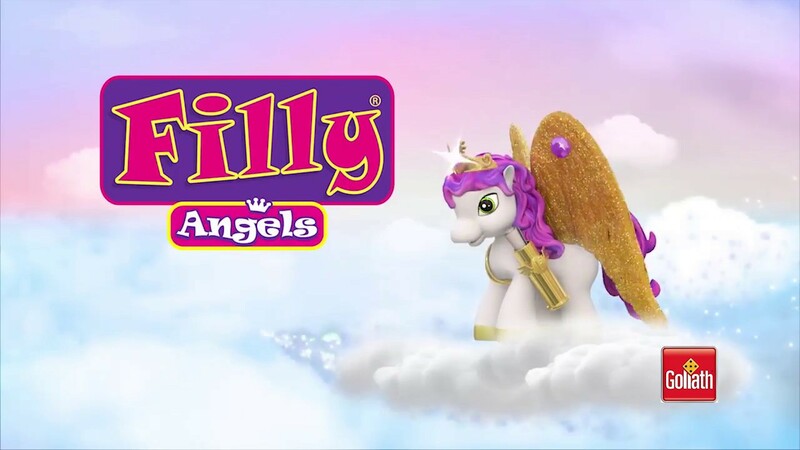 As this toyline was released so far after the start of Filly Funtasia development, the Angels most likely won't appear in the show (unless there's a second season...), but this toyline should still probably be regarded as canon. 23 August 2018: The Filly Funtasia episode "The Missing Student" (later retitled "The Blue Rainbow") is nominated for Best Animation at the 58th Asia-Pacific Film Festival. It loses to "Fundamental". Early 2019: All of Dracco's websites go offline for unknown reasons at some point during early 2019. 3 March 2019: With no warning, trailers for the imminent airing of Filly Funtasia suddenly appear on Frisbee. 11 March 2019: First episode of Filly Funtasia airs on Frisbee.